God bless my daughter’s teacher for letting me be a fly on that wall. And I am so glad that she is a fan of Jesus. At some point though, I hope she is more than that. At some point, I want her to be friends with Jesus. It reminds me of something that happened several years ago. A cousin from a small town emailed to ask if we had any good baseball card shops nearby. He wanted a specific card, an Albert Pujols. I know absolutely nothing about baseball, but thought I could manage to help him out. I headed into the baseball card shop that Saturday morning, “Albert Pujols” scribbled on a scrap of paper to remind me of what I was after. The store was crowded with men and boys of all ages, sifting through boxes of cards and comparing treasures. I approached the counter. “Can I help you?” the clerk greeted me. “Yes,” I replied. “I am looking for a baseball card- an Albert Pew-Goals,” I said. From behind me, there was quiet laughter and talking. My blunder was very obvious. “It’s Poo-holes, ma’am.” More laughter from the experts behind me. He was ringing me up when the bell on the door jingled, and John Danks walked in. 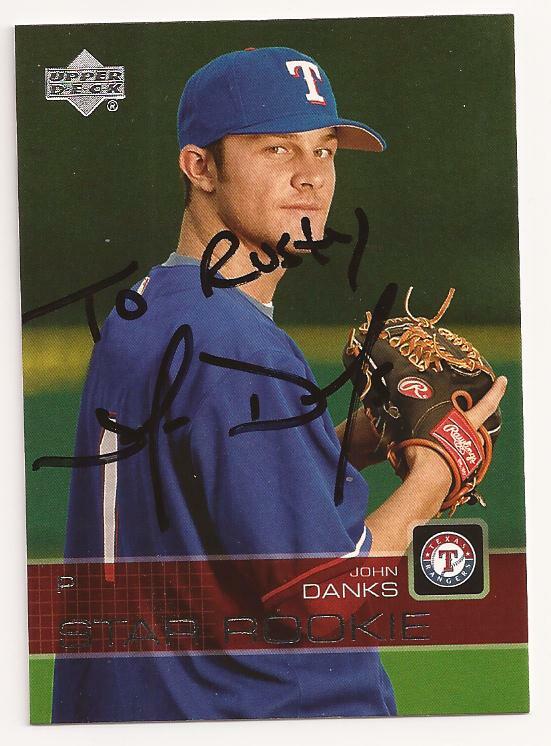 He had just been selected in the first round of the MLB draft as a pitcher by the Texas Rangers, going number 8 overall in the selection (kind of a big deal). He later ended up being a starting pitcher for the Chicago White Sox, a real baseball rockstar. None of this I would have known because I am not a baseball fan, and I wasn’t really a John Danks fan. No, not a fan, but a friend. I had been one of John’s Sunday School teachers two years before. “Sure thing.” He signed my cards. I thanked him, turned around, smiled and shrugged at the speechless, slack-jawed men in the store, and headed out. Those guys were fans of John Danks. They knew all about him, knew enough to be impressed by him, but they did not know him. I was a friend of John Danks. I knew him by name, and he knew me. I could approach him, address him, relate to him. I could speak with him and expect a response. See the difference? I am glad that my daughter is a fan of Jesus, and do not fault her for her terminology. But it did get me thinking. Even more than I want her to be His fan, I want her to be His friend. I want her to not only to know about Jesus, I want her to know Jesus. Here’s what Jesus said in the book of John about being His friend: You are my friends if you do what I command. I no longer call you servants, because a servant does not know his master’s business. Instead, I have called you friends, for everything that I learned from my Father I have made known to you. You did not choose me, but I chose you and appointed you so that you might go and bear fruit—fruit that will last—and so that whatever you ask in my name the Father will give you. This is my command: Love each other. The difference between me and those guys in the baseball card shop was that I could walk right up to John Danks and talk to him like I knew him… because I did! I was his friend. Being a friend of Jesus gives me the same opportunity. I not only have ears that have heard of Him, but eyes that have seen Him, as well. My prayer for my daughter, for all of us actually, is that we will know what a friend we have in Jesus. I was just thinking I needed a good dose of White’s Wisdoms. Thanks for giving me my fix!